Basketball fans may want to keep their remotes handy tonight. TNT offers a full night of NBA action with Miami Heat v. New York Knicks at 7 p.m. CT, followed by Oklahoma City Thunder v. Denver Nuggets at 9:30. College coverage includes Memphis at Louisville followed by Arizona at UCLA (ESPN, starting at 6 p.m.). 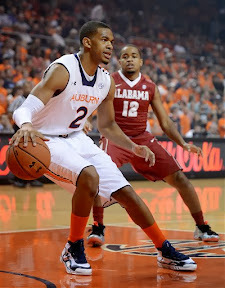 At the same time, ESPN2 will cover Auburn at Mississippi followed by Michigan at Nebraska. Also starting at 6, Fox Sports 1 (FS1) is serving up three back-to-back matches, with DePaul at Butler, Marquette at Xavier and California at Oregon. TNT, ESPN, ESPN2, and FS1 are available to most Suddenlink customers who have what is commonly known as Expanded Basic TV service. The FOX Sports Emmy Award-nominated “Being” documentary series is back with a six-episode look at former heavyweight boxing champion Mike Tyson. 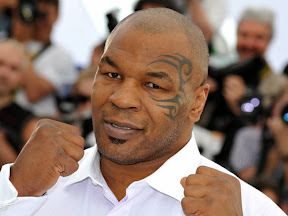 “Being: Mike Tyson” premieres Sunday, Sept. 22, on FOX, either before (2:30 – 3:00 p.m. CT) or after (3:30 – 4:00) local NFL coverage. The remaining five episodes will move to a regular time slot, Tuesdays on FOX Sports 1 at 9:30 p.m., beginning Sept, 24. Check local listings for Sunday’s premiere episode time. Fox Sports 1 is available to most Suddenlink customers who have what is commonly known as Expanded Basic TV service. Fight Night 28 will pit light heavyweight dominator Glover Teixiera against The Ultimate Fighter 8 winner Ryan “Darth” Bader. Also on the card are Ronaldo Souza and Yushin Okami. Immediately following, season 18 begins for “The Ultimate Fighter,” featuring rivals Ronda Rousey and Miesha Tate as the first female coaches for both male and female fighters since the show’s 2005 inception. Fox Networks have been busy of late, and they’re not finished quite yet. Changes are summarized in the image above (click to enlarge) and copy below. Check local listings for channel numbers. We also recommend you check your DVR settings to make sure the affected shows record on the right day, time, and channel. Fox’s planned changes could impact series (a.k.a., season pass) recordings, plus other recording options available on your Suddenlink DVR or Suddenlink TiVo device. Also, depending on when your channel guide updates, you may need to wait until the day before or day of the noted show changes to update your DVR settings. Fox Networks changed the name of the Speed Channel to Fox Sports 1. 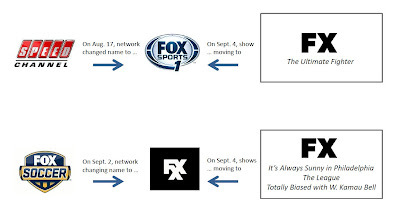 Fox Networks will change the name of Fox Soccer to FXX. Immediately after the change, FXX will be on the same Suddenlink channel number that Fox Soccer is on today and remain available to most Suddenlink customers on an incremental level of digital TV service (either “digital basic” or a “digital tier”). Fox Networks will move the following shows from FX to FXX: “It’s Always Sunny in Philadelphia” (Wednesdays, 9 p.m. CT), “The League” (Wednesdays, 9:30 p.m. CT), and “Totally Biased with W. Kamau Bell” (Mondays through Thursdays, 10 p.m. CT). Fox Networks will move “The Ultimate Fighter” (Wednesdays, 9 p.m. CT) from FX to Fox Sports 1. As time and resources allow, we attempt to review and publish a representative sample of comments, including those with points-of-view contrary to our own. We reserve the right to edit or reject comments to eliminate profanity, personal attacks, off-topic or duplicative remarks, etc. Comments are closed on new posts after 48 hours.